Mom update: She’s about the same—perhaps a bit more paranoid. My brother stopped by last night and the meds are all hanging out together in a big bowl, like Halloween candy waiting for trick-or-treaters. 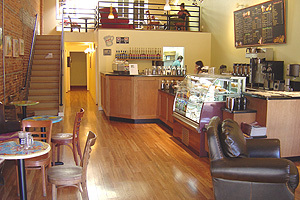 Java Jones on State Street. Image courtesy of SantaBarbara.com. The Scout is looking at ranches in the area for a John Deere spot. I’m going to sit here, get some work done, then I’m going for a big ole walk. Later, the Scout and I will probably have a drink and perhaps even dinner at Dargan’s (we’ve had fun watching tennis matches there, and the Irish Stew is good enough). In this season of thanksgiving, my thanks again to you for your good thoughts, kind words, prayers. For joining me in my outrage about our health care system. For understanding how frustrating it is to be in a relationship with someone who is bipolar. For continuing to read during my struggle to describe mania. To Susan for her verbal spa. To Suebob (I waved when we drove through Ventura!) who left a comment pointing me to a post entitled The Crazy Mothers Club over at Godammit I’m Mad. I’m now a member and have almost mastered the secret handshake. Though I recognize that I’m emotionally exhausted, I’m having a good day. I hope you do the same. This entry was posted on 25 November, 2008 at 12:51 pm and is filed under Mental Health, Travel. You can follow any responses to this entry through the RSS 2.0 feed. You can leave a response, or trackback from your own site. Bless you, Kelly. I wish I had words to make it better. I read the rest of the comments from yesterday and folks really had a lot to offer, thank goodness. I’m glad you’re having a good day. Many more, many more to come. After my mom died in early 2007, my dad began to fail immediately but it took him more than a year and a half to join her in Heaven. It was painful and frustrating and heartbreaking and mindnumbing. I thought about blogging about it from time to time but never did. It probably would have been therapeutic. I don’t think there’s a right or wrong way to go through the pain of seeing parents become someone they’re not. It just is. If you feel like you need to stop blogging about it for awhile, follow that instinct. If you feel like continuing, we’re with you all the way. Sending you thoughts of hope and peace. Ditto Ann. We’re with you. so I had to read the whole poem. I don’t know what it means, or maybe I do, but only on a viseral level (yea! I got to use my word! ), but it’s so damn melancholy and lovely. Do you know him? When my daughter was diagnosed with epilepsy all I could do was think about it and talk about. It was really hard, and I started therapy. But eventually I got really tired of talking about me and my problems. Frankly, I got really bored by them. And that was how I knew I was ready to move on. Maybe you’re there too. If so, feel grateful.